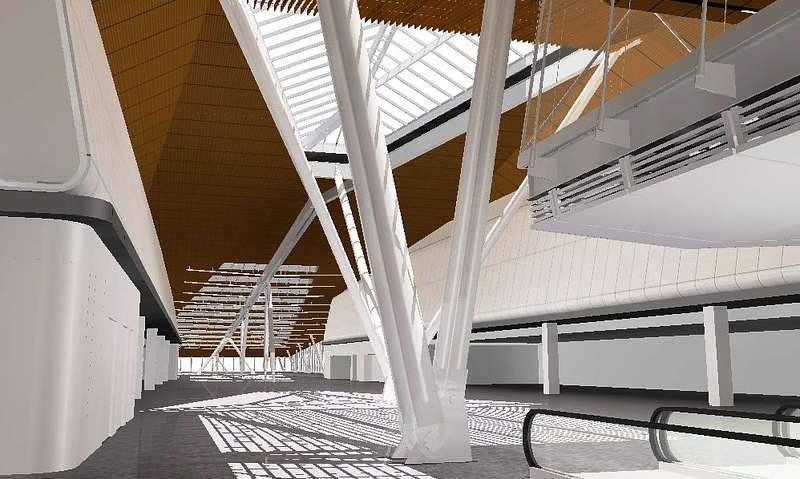 The Midfield Concourse was intended to replace an existing Midfield Concourse to accommodate growth projections at a major large hub airport. As a partner on the structural team, Woods • Peacock provided both design and peer review services until the project was put on hold after completion of the Design Development stage. The 4000-foot long concourse design was separated into parts, with Woods • Peacock designing the east and west ends of the concourse and all of the gatehouses. The gatehouses provide passenger circulation from aircraft to both the concourse level and the elevated sterile corridor for arriving international travelers. The concourse ends are 500-foot long structures that taper in both width and elevation, featuring exposed steel with 84-foot clear spacing between branched columns and triangular shaped skylights supported by a three branch column tree. Peer review services included analyses of both the typical concourse building cross section and the Federal Inspections Station (FIS) long-span exposed steel trusses.